As a brother of the Lord you hung on the wood. 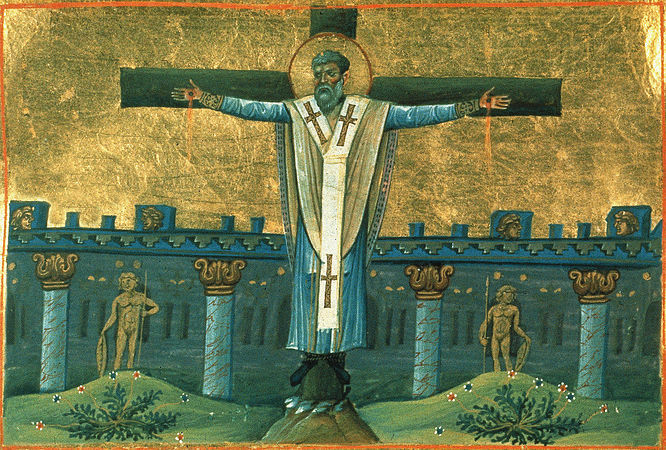 On the twenty-seventh Symeon was affixed to the cross. According to Eusebius (Church History, Bk. 3, Ch. 11) who quotes Hegesippus, Saint Symeon is said to have been the son of Cleopas, otherwise called Alphaeus, who was father also of Saint James the Lesser, of Saint Jude the Apostle, and of another son named Joses. Cleopas, according to tradition, was Saint Joseph the Betrothed's brother; thus Saint Symeon was the nephew of Saint Joseph the Betrothed and the cousin of our Savior. However, Symeon, whose diminutive is Simon, and his brothers are sometimes identified with the "brothers of the Lord", who are mentioned in passing in the Gospels (Matt. 13:55, Mk. 6:3), although Aramaic had no term for "cousin" and often referred to them as brothers. James the Lesser, otherwise known as the Brother of our Lord, was the first bishop of Jerusalem. Whether this James and Symeon were sons of Joseph from a previous marriage or the sons of his brother Cleopas and thus nephews of Joseph is up for debate. The Synaxarion of Constantinople identifies Symeon with the name Cleopas, and says he and his brothers were sons of Joseph. Others hold that James was the son of Joseph, while his successor Symeon was the cousin of James and Jesus and the son of Cleopas. We cannot doubt but that he was an early follower of Christ, and tradition assigns the family’s residence to Nazareth. 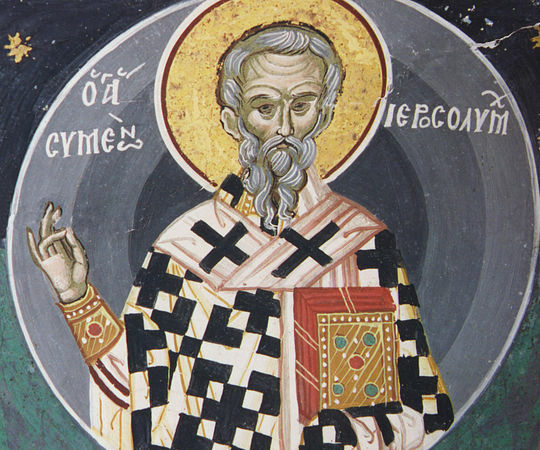 When the Jews massacred Saint James the Brother of our Lord, being the first Bishop of Jerusalem, his brother/cousin Symeon reproached them for their atrocious cruelty. After this first bishop of Jerusalem had been put to death in the year 62, that is, twenty-nine years after our Savior’s Resurrection, the Apostles met at Jerusalem to appoint a successor, and unanimously chose Saint Symeon, who had probably already assisted his brother/cousin in the government of that Church. In the year 66 or 67, during which Saints Peter and Paul suffered martyrdom at Rome, civil war broke out in Judea as a result of the hostility of the Jews against the Romans and their seditions. According to Hegesippus, the Christians of Jerusalem were warned by God of the impending destruction of that city. With Saint Symeon at their head, they therefore fled Jerusalem in that year and retired beyond the Jordan to a small city called Pella, before Vespasian, Nero’s General, later Roman Emperor, entered Judea. After the taking and burning of Jerusalem they returned there once more, still under the leadership of Saint Symeon, and settled amid its ruins. The Jerusalem Church flourished again for a few years until razed by Adrian, and multitudes of Jews were converted by the great number of prodigies and miracles wrought in its midst. The emperors Vespasian and Domitian had commanded all to be put to death who were of the race of David. Symeon escaped Vespasian, but Domitian found out he was a cousin of the Lord, so he made him drink poison from scorpions, snakes and other poisonous reptiles. From this Symeon remained unharmed. When Trajan renewed the same decree, however, certain heretics and Jews accused the Saint before the Roman governor in Palestine, as being both of the race of David and a Christian. The holy bishop was condemned to be crucified. He died in the year 107, after having undergone during several days the usual tortures, though he was one hundred and twenty years old. He suffered these torments with so much patience that he won universal admiration. He had governed the Church of Jerusalem for about forty years. Toward heaven and the heavenly world, he raises his spirit. And to become worthy of Paradise divine. Now waits with the body to resurrect gloriously. We sacredly acclaim thee as Jesus Christ's kinsman, and as His steadfast Martyr, O all-lauded Hierarch. For bravely hast thou destroyed all deception and kept the faith. Hence, O Symeon, we keep thy holy remembrance on this festive day; and by thy prayers, we are granted the pardon of grievous sins. Since the Church hath Symeon, the God-proclaimer, as a great and shining star, she is now guided by his light as she doth cry out in joy today: Rejoice, O ven'rable summit of martyred Saints.